OFGEM is extremely relaxed about Wholesale profiteering by the Big Six energy companies. 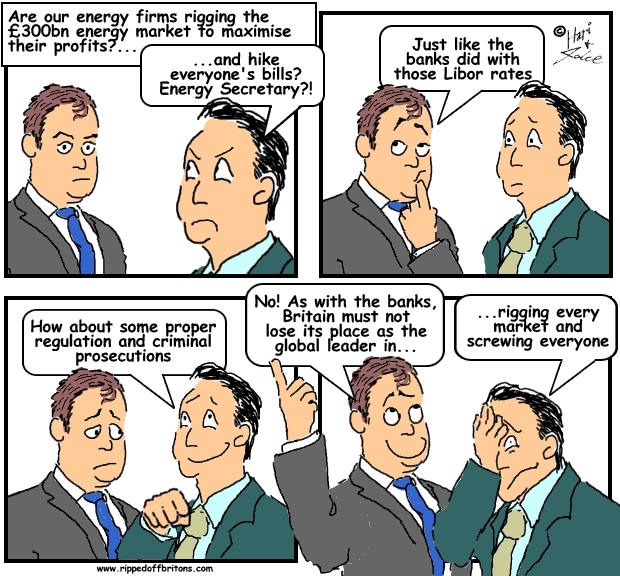 Pity the poor executives of OFGEM, Tweedledum to the FCA’s Tweedledee. Both OFGEM (Office of Gas and Electricity Markets), regulator of the UK energy market, and the FCA (Financial Conduct Authority), regulator of the UK finance industry, are just actors on Britain’s regulatory stage. And like actors anywhere, they can only read from the script they are given. A script written by lawmakers in Parliament, in a farce directed by Cabinet Ministers. When one actor fails to smile and shout and sob as directed there are plenty of replacements to choose from. Plenty of players eager to pick up a medal or perhaps even a damehood or knighthood for services rendered (or artfully not rendered). And that's not to mention a generous six figure salary for those who get to the top. OFGEM’s report for 2014-15, showed their CEO taking £215,000 for that year; Martin Wheatley, FCA CEO until being defenestrated in September 2015, was on a basic salary of £460,000. You will notice the FCA’s boss is paid considerably more than OFGEM’s CEO. Perhaps because the public have a better understanding of financial rip-offs, and thus have more contempt for the FCA’s dopey regulation of the banks. This is of course quite unfair, as OFGEM’s performance is entirely equally dopey. If only the public understood the energy market better then OFGEM’s boss would surely get a bumper hike in salary to compensate for the heightened public contempt. So we thought we would throw a little more light on OFGEM’s lamentable performance. And perhaps its CEO can get a well deserved, if not earned, payrise. 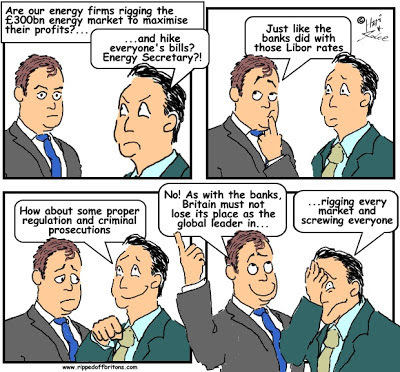 In 2011 OFGEM commissioned the accountancy firm BDO to look into the issue of energy pricing transparency. BDO made 8 recommendations, of which OFGEM ditched 6 and watered down the remaining 2. Perhaps BDO got the wrong end of the stick, thinking OFGEM wanted them to recommend how to INCREASE transparency! The reality is the Big Six energy companies operate in both the Wholesale market (generating) and the Retail market (selling to end users, like you and me and the companies we work for). They are all making profit from the "Wholesale costs" shown in the OFGEM graph above. However OFGEM fails to show this. OFGEM's "Wholesale Energy Markets in 2015" report shows all the Big Six generate a significant portion of the electricity they sell on the Retail market. EDF actually generates more than it sells. So OFGEM provides the helpful graph to show Retail profits. But fails to provide the equivalent to show what the Wholesale profits of the Big Six are. An analysis was done by Derek Louden, an energy industry commentator, which may explain why. According to Louden's calculations, the generators are generating very healthy profits indeed. 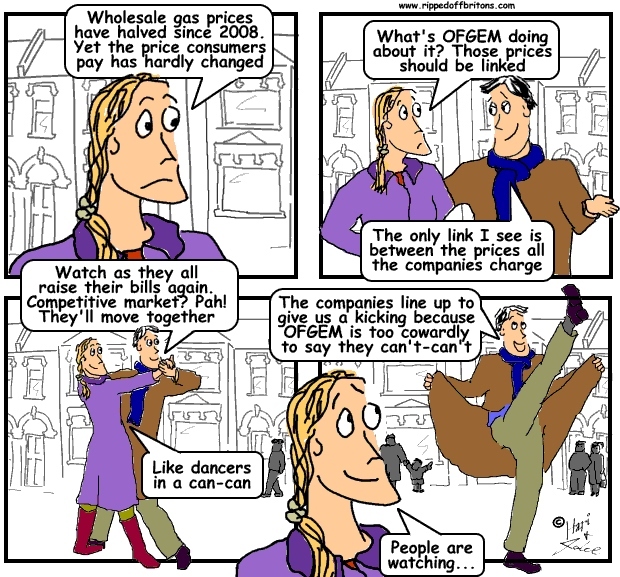 OFGEM themselves gave the game away in a report way back in 2010, "Electricity and Gas Supply Market Report, Ref:23/10". Their graph shows how from 2005 the energy companies suddenly switched their profits from their Retail to their Wholesale businesses. 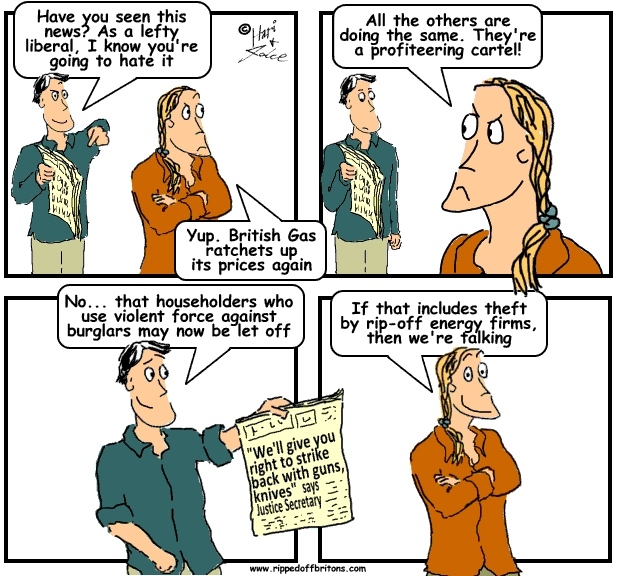 Explaining why they and OFGEM now seem to focus on the teensie retail profit, while ignoring the fat wholesale profit. (As far as we can tell, OFGEM haven't been so forthcoming since this 2010 report - please let us know if we are mistaken). In 2015 the Competition and Markets Authority (CMA) published its "Energy Market Investigation, Notice of possible remedies". In this report the CMA identified a "Lack of robustness and transparency in regulatory decision-making", specifying "The lack of a regulatory requirement for clear and relevant financial reporting concerning generation and retail profitability." So unaffordable energy was a significant contributor to the 27,000 excess winter deaths over the decade to 2012? 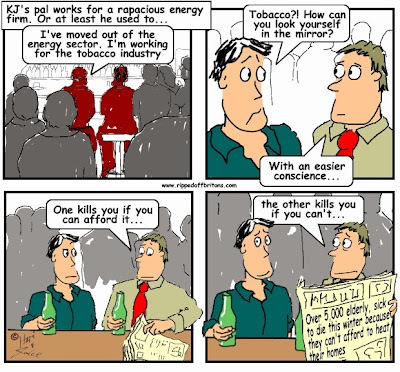 Having seen junior traders from miscreant banks led off to prison while their directors are left to buy each other drinks in their clubs, we think junior energy company executives would be prudent to keep evidence for when the corporate manslaughter charges are brought in a decade or two. Miliband didn’t do it. Cameron didn't do it either. "the Committee concludes Ofwat has consistently over-estimated water companies’ financing and tax costs when setting price limits. As a result, water companies made windfall gains of at least £1.2 billion between 2010 and 2015 from bills being higher than necessary."